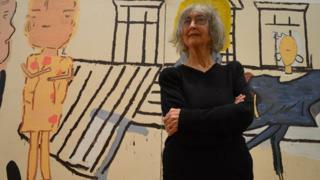 Artist Rose Wylie has won one of the UK's most prestigious painting awards at the age of 80. The £25,000 John Moores Painting Prize, which has been handed out in Liverpool, is Wylie's latest accolade after being belatedly discovered by the art world. Her paintings have begun to receive recognition in the past five years. In 2013, Wylie, from Kent, staged an exhibition at Tate Britain and was described as "a national treasure" by fellow artist Cornelia Parker. Unlike the Turner Prize, which excludes artists over the age of 50, the John Moores Prize has no upper age limit. Founded in 1957, previous winners have included David Hockney, Richard Hamilton and Peter Doig. Wylie won for her painting PV Windows and Floorboards, which represents figures at a private view in an art gallery. The prize comes 60 years after she began studying at Folkestone and Dover School of Art. But she received more attention at the time as a model in an advertisement for Aero chocolate bars. After marrying artist Roy Oxlade, who died earlier this year, Wylie gave up painting to raise their family. She resumed her art training at the Royal College of Art while in her mid-40s. But more years passed before she began to receive recognition on the art scene. In 2010, at the age of 76, she was selected to represent the UK in the Women to Watch exhibition at the National Museum of Women in the Arts in Washington DC, which showcases up-and-coming artists. She received a Paul Hamlyn Award for Visual Art in 2011 and her first retrospective opened the Jerwood Gallery in Hastings in 2012. Wylie's work has recently been exhibited in New York and Amsterdam and she has exhibitions planned for Wolfsburg, Dublin and another in New York. Her large, vibrant images of figures, film stars and sporting heroes have been described as "exaggeratedly naive" and "quasi-cartoonish". Wylie said it was "wonderful" to finally receive recognition. "I'm pretty well floating," she said. "I'm very happy about it. It's very nice to be included. I've always liked the idea of being included in major exhibitions and stuff." Asked why it had taken so long for the success to arrive, she replied: "I don't know. I've been painting a long time and then suddenly it seems that they are more interesting than they were before, when in fact they're not. They're just the same. It's a mystery to me." The other artists on the shortlist for this year's John Moores Prize, which is part of the Liverpool Biennial art festival, were Rae Hicks, Juliette Losq, Alessandro Raho and Mandy Payne. Wylie received her award during a ceremony on Friday at Liverpool's Walker Art Gallery, where she will give a talk on Saturday. Sandra Penketh, director of art galleries at National Museums Liverpool, said Wylie's picture was "a striking painting and a worthy winner". "The painting achieves an interesting balance, containing bold colours and form but also a sense of mystery and an unfinished story," she said. A BBC Four documentary about this year's John Moores Prize will be broadcast on Sunday.